DAWN: Khalid Shahanshah, the chief security officer of PPP co-chairperson Asif Ali Zardari, was assassinated on Tuesday afternoon outside his Clifton residence, police and witnesses said. They said that gunmen on a white car sprayed him with a volley of bullets while he was stepping off his double-cabin vehicle in front of his house at Khyaban-i-Bukhari. If many may recall a video surfaced after Benazir Bhutto assassination in Islamabad which showed Khalid Shahinshah suspiciously signaling to some one in the crowd. The PPP and its supporters argue that the “common man” cares more about inflation than the restoration of the judiciary. They insist that forcing the present government’s hand on the judges’ issue would create political instability, threaten the democratic process and make it difficult for the elected government to resolve the economic issues. Certainly, a major effort is needed to curb inflation, reduce unemployment and put our country on a sustainable path towards progress. But is the judges’ issue indeed beginning to be a distraction for efforts to solve the country’s economic problems, or is this only a false excuse to make the two issues look mutually exclusive? After all, the PPP supporters did not see inflation as a more urgent issue than the judiciary when the PPP was trying to get political mileage from the lawyers’ movement after March 9 last year and was passionately in favour of the independence of the judiciary. Honest attempts at addressing any problem need to start from development of a team of competent people who can put together a coherent programme. This programme needs to be included in the party’s manifesto and shared with the public instead of spending all the time on rhetoric centred on personalities and emotional blackmail. A political party needs to do such homework before coming into power so that it can get to work straightaway and have a dedicated team of economists capable of working out the economic problems, regardless of the political situation and irrespective of the lawyers’ movement. Lets not live in cloud-cuckoo land. Zardari asked for 30 days time to restore judges. It was given. He agreed with Nawaz for an extension of 12 days. We all waited in vain. Now we are expected to continue waiting for an indefinite period of time (no ulti ginti, please) to allow ‘democracy to flourish’ and his promises to bear fruit. There is all this rubbish floated by PPP and pro-Musharraf elements around about the ‘complications’ involved in restoration of judges. 21 former judges of the Supreme Court (including 5 former Chief Justices) have publicly stated that all that is required is an executive order (with a parliamentary resolution for moral backing only – if politically necessary). As for the newly appointed incumbents, the former judges stated that they have no legal right to remain in office but their appointments can be regularised (purely for humanitarian considerations) by real Chief Justice in accordance with the Al-Jehad case. Apart from 3 or 4 (like Fakhruddin and Wajihuddin) none of these former judges were even involved in the lawyers’ movement and are completely apolitical. I take their word over PPP politician-semi lawyers like Latif Khosa, Farooq Naek, Babar Awan and Musharraf-cronies like Hafeez Pirzada and Malik Qayyum. Islamabad May20:”We want governance and not just government”, PPP co-chairman Asif Zardari had bravely declared soon after elections. Unfortunately for him, that runs counter to Gen. (R) Pervez Musharraf’s concept of shedding the authority he had usurped in 1999 and has retained much of to date, February 18 elections notwithstanding. In November 2002 while swearing in Zafrullah Jamali as Prime Minister, Musharraf declared that he was “transferring responsibility” (not power) to his protégé. Thus he ushered in a unique era of a dangerous dichotomy where the person to be held responsible for everything did not exercise any real authority while the one who held all levers of power, was neither responsible nor responsive to anybody. What we have at present is, in fact, another hybrid structure in which there is further dichotomy within the present dispensation. After initial shock on February 18 that left him in a stupor for some weeks, Musharraf has recouped and appears steadily returning to the driving seat. “The Presidency has energized”, says Musharraf’s inveterate foe, Nawaz Sharif, in utter frustration over the way things have shaped up in recent weeks. Quite often, Musharraf seems to be setting the agenda for the PPP on critical issues with the benign pat from the US. This is seriously compromising PPP’s enlightened interests and diluted the popular mandate. Cui Bono: Is This Constitutional Amendment a Ploy? The media is speculating about a 62 point draft of a constitutional amendment that would ostensibly cleanse the 1973 constitution of the changes made by Pervez Musharraf. Constitution is the basic declaration of the voice of people in governing themselves, stated as laws and principles that outlines the functions and limits of state institutions. Since it affects all people, and for it to be effective, it has to have widest possible consensus of the people. 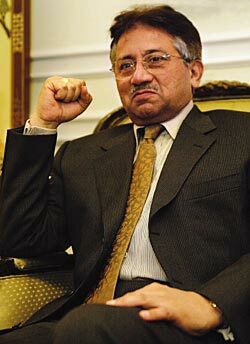 This attempt by Naik and Zardari to “reverse” the Musharraf changes is self defeating. It is like the NRO that has a cut off date that benefits the Bhuttos and Zardaris but does not go far back enough to affect other politicians. 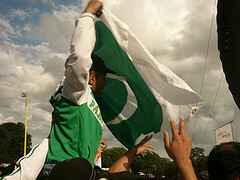 I just came across this write up found on Chowk published on November 7th 2007, its definitely worth reading. In addition to Mr. Shaukat Aziz, current Prime Minister of Pakistan, numerous former Citibankers occupy highly influential positions in the government and the private sector in Pakistan. Citibank is one of the largest banks, and operates one of the largest private banks in the US and globally. Of the 40 private banks reviewed by the Federal Reserve during its industry wide examination of private banking in the 1990s, only one — Citibank — was reviewed in detail by Federal Reserve examiners three years in a row. It is a private bank that has struggled with a wide range of anti-money laundering issues. Although Citibank, under Shaukat Aziz’s leadership (from May 1997 to October 1999) and his successors’ has done much to tighten controls, it was beset by numerous scandals during the 1990s. A 1999 US Congress investigation (exact reference given at end) into Citibank, provides a fascinating inside look at how Citibank helped launder the ill-gotten gains of four high profile corrupt figures: Raul Salinas, brother of the former president of Mexico, Carlos Salinas, Asif Ali Zardari, the husband of Benazir Bhutto, former Prime Minister of Pakistan (reproduced below), El Hadj Omar Bongo, the elected president of Gabon since 1967, and Mohammed, Ibrahim, and Abba Sani Abacha, three sons of General Sani Abacha, who was the military leader of Nigeria from 1993 until his death in 1998. Of the four case histories provided in the Report, the following is a complete excerpt of the Case History for Asif Zardari. The report also provides photocopies of signed documents, banks records, etc. (listed below, at the end). You may like to know that the famous ex-Federal Secretary Salman Farouqi called Chairman PNSC (Sikandar Viqar Naqvi) and asked him to arrange transportation of his personal belongings from USA to Pakistan. However, Chairman PNSC politely told him that PNSC ships do not visit USA. You can now draw your own conclusions about what to expect during the next five years of PPP rule. It could be just a funny joke but when I see a reference of Salman Farooqi it instantly shuttles back into his powerful reign in the 90’s when everything such as this was very much possible. As a disclaimer, please treat this post at face value, I personally cannot confirm this rumor and share it only to maybe forewarn us to our new found liberated future. It is said that a leopard never changes his spots — has the PPP returned into power for the 3rd time all baptized to do no sin? or do we sit and wait for the actual fireworks to begin, I sadly expect them to be better then before. The Minister of Information just recently made an announcement that the PEMRA Ordinance of 2002 which was extensively amended on Nov 3rd is being repealed by floating a Bill in the Parliament. It has been stated by the information minister today that a bill has been moved in the parliament which seeks to repeal the November 3rd, 2007, amendments in the Pemra Ordinance, 2007. For the reasons stated herein below, this move will damage the stance of the lawyers that no constitutional amendment is required to restore the deposed judges. PPP and PML-N have finally sorted out the power sharing in Punjab with a total of 35 ministries, PML-N would obtain 22 while PPP will settle with the remaining 13. While Chief Minister, Speaker and Deputy Speaker would be retained by PML-N. Ideally this is the best deal for PML-N as it retains their control over the province, probably a fair trade-off with Zardari since the arrival of their new coalition partners in the form of MQM. Quite literally these days everyone has a theory so what is your analysis of the developing situation amidst rumors of a potential split between PPP and PML-N on this core issue of the restoration of judiciary?